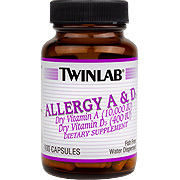 Allergy Vitamin A & D Caps are designed specially for fish and fish oil allergic individuals. Water dispersed Vitamin A and Vitamin D in their dry form are easily digested and assimilated in the body. Allergy A & D is well tolerated by most highly allergic individuals. No tablet binders, coatings or colorings. Allergy A & D is free of the most common allergens such as fish, soy, yeast, barley, wheat, lactose (milk sugar) and all milk, citrus and egg products. Vitamin A is fat-soluble, stored in body fat. Although not necessary to intake every day, Vitamin A is vital to the body. 90% of it is stored in liver. Vitamin A is found in two formes - Retinol (preformed Vitamin A) or Retinoids (beta-carotene). Beta-carotene is a precursor to Vitamin A, formed in the intestine, liver, and kidneys. Beta-carotene is found in deep-yellow and deep-green leafy vegetables. Vitamin A is found in fish liver oils, egg yolk, liver, and fortified foods such as milk or margarine. Vitamin D work so synergistically together, that I thought it best to cover them together rather than separately. Calcium is of obvious importance to the human body as it comprises our bones, teeth, nails, hair, and is a vital mineral in maintaining a healthy body. Vitamin D is used by the body to help stimulate the increased absorption of ingested calcium, among other things. Vitamin D is very versatile and you don't want to be without it! As a dietary supplement, take one Allergy A & D capsule daily. Keep tightly closed in a cool, dry place. Vitamin D-3 400 IU, Vitamin A (from Retinyl Acetate) 10,000 IU. Allergy A & D is shipped in a discrete, unmarked package. Orders are processed immediately and usually take about 3 to 5 working days to be received. We do ask that you try it for 2 to 3 weeks to feel the full effects. Any information received is used only for order processing and shipping purposes. Your information, such as e-mail address, will never be disclosed to a third party.